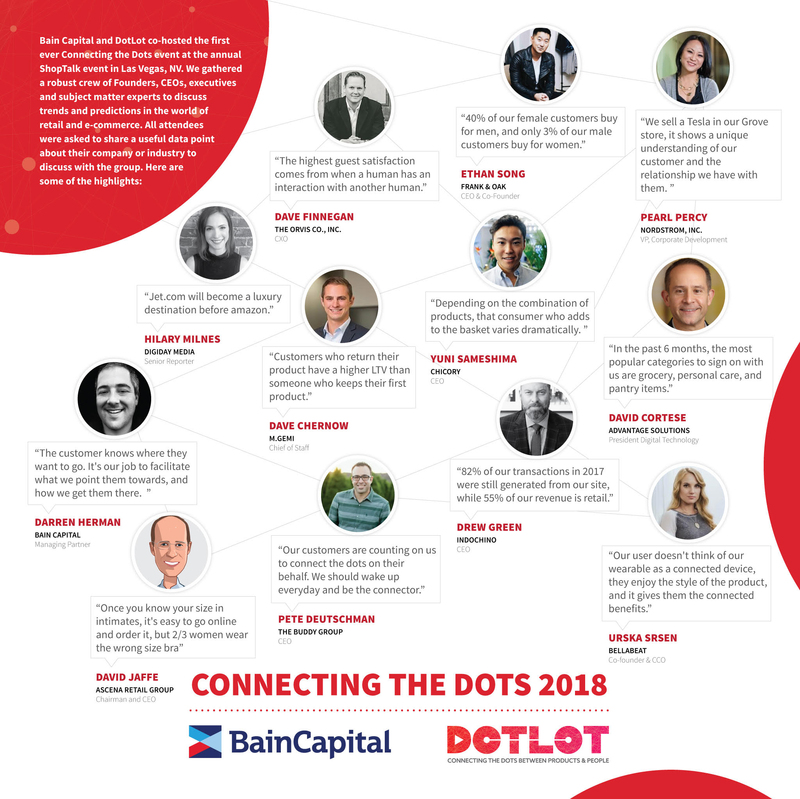 Bain Capital and DotLot co-hosted the first ever Connecting the Dots Luncheon at the annual ShopTalk event in Las Vegas, NV. We gathered a robust crew of Founders, CEOs, executives and subject matter experts to discuss trends and predictions in the world of retail and e-commerce. All attendees were asked to share a useful data point about their company or industry to share and discuss with the group. Attendees included representatives from Nordstrom, Ascena Retail Group, Bob’s Discount Furniture, Chicory, Indochino, and many others. Going around the room, we heard some invaluable insights about the current landscape of retail and e-commerce from operators who are leaders in their respective categories and trailblazers in unique and effective e-commerce strategies. We would like to thank all who attended. We hope you enjoyed this unique opportunity to connect the dots with other e-commerce experts. See you next year!